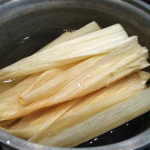 TAMALES | Just Cuc It! It’s holiday season and one of the best traditions here in Houston is for Hispanic families to come together and make TAMALES! 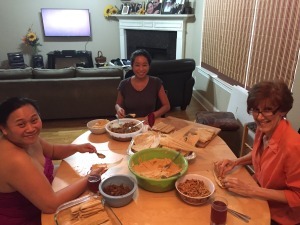 A few years ago, I had the opportunity to make tamales with a Mexican family. They bought already-made masa and by the time I got there, I only got to be a part of the actual “slather masa on corn husk, add meat and roll” part! 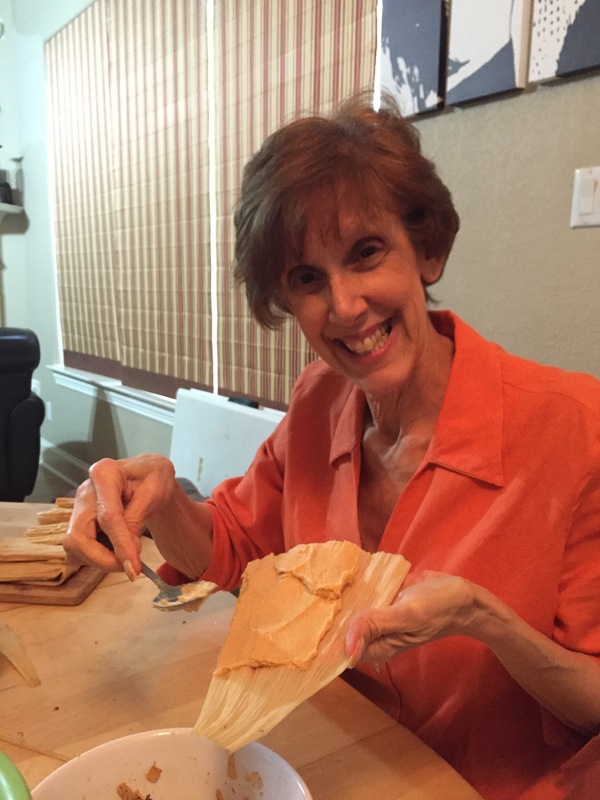 A very special person asked me if I would make tamales with her this past weekend . . . I was a bit intimidated at first, but after reading a few recipes on the web, I decided that this would be a huge undertaking, but totally worth the effort . . . I hope 😛 I opted to do it all from scratch and make my own masa dough! 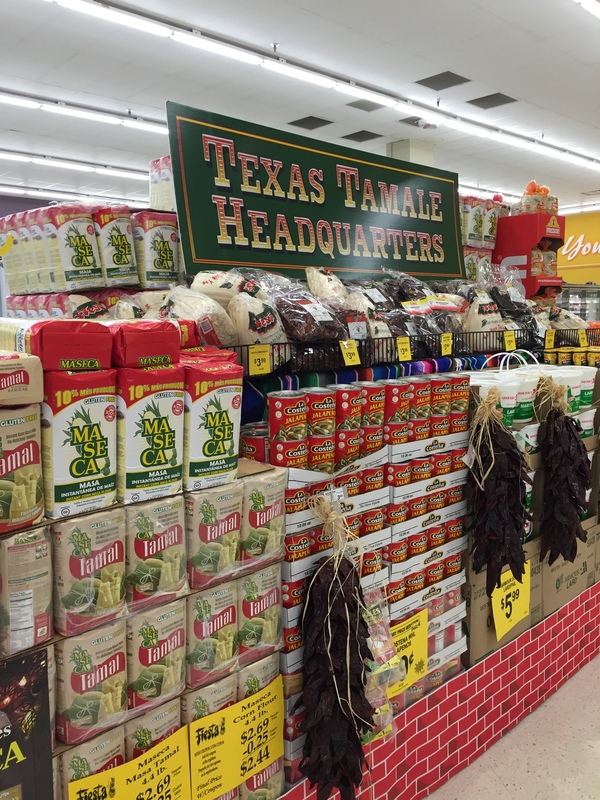 Destination: Fiesta Market! 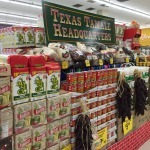 Just my luck, first thing I see as I enter the store is the TEXAS TAMALE Headquarters display! I was able to buy everything I needed for this Tamale Adventure! It actually took me two days because I cooked all of the filler meats the night before. I stewed my carnitas for 4 hours in a crock pot. I stewed the beef brisket for the same amount of time in a separate crock pot and the chicken was boiled for the stock. *This recipe does not include my carnitas or shredded beef brisket recipes. I have not posted those yet, but will soon! So the night before, I put my pork and beef into separate crock pots using my recipes for stewed carnitas and shredded beef brisket. I also boiled the chicken breasts with a bay leaf, half an onion, some white pepper, onion powder, garlic powder , a little salt and one dried roasted chipotle pepper and one dried, roasted ancho poblano pepper. If you happen to have any fresh herbs lying around, you can add a sprig of thyme or oregano for a more fragrant stock. I added sage that was leftover from Thanksgiving preps. 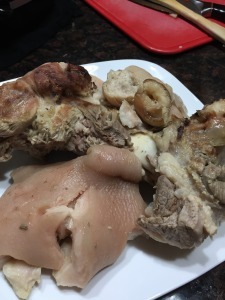 I trimmed the pork meat away from the bone and trimmed the fat and skin as well. The bone, fat and skin went into a pot for stock. 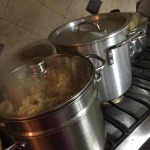 I added the same ingredients to this pot as I did for the chicken stock. 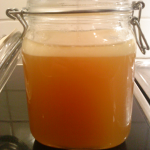 Once both stocks were done, I mixed them together (the chicken and the pork broth). 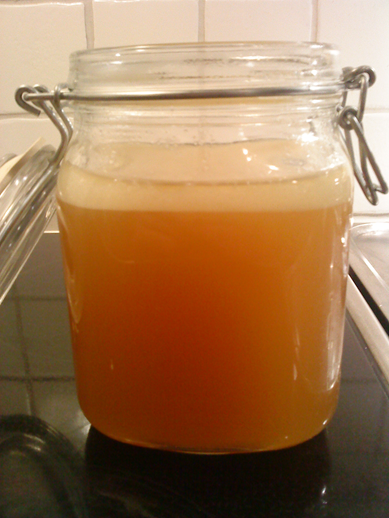 Make sure you add enough water to yield at least 10 cups of broth. 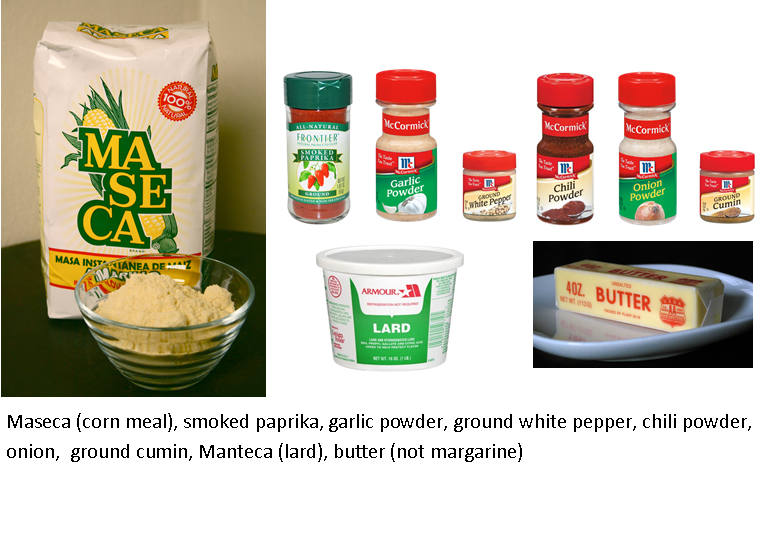 Once all ingredients are mixed thoroughly, add the lard/butter mixture to the bowl. Keep working the dough with your hands, folding it. Add stock to the dough one cup at a time, checking the consistency as you go. A lot of the recipes I read noted that the dough should be like peanut butter and that you could test if the dough is ready by using the cold water test (drop a tiny ball of the masa in a glass of cold water and if it floats, then it is ready). We tried this several times until we finally got one to semi-float. I feel that the consistency was even softer than peanut butter when I was finally satisfied that it was ready. This was the most diffiult part of the process . 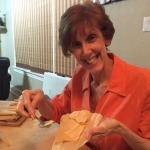 . . determining the readiness of the masa! 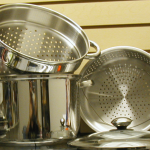 Start heating water in the pots, leaving the strainer pot out to put the tamales in. 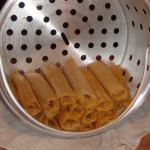 Turn the pot on its side to lay tamales so that they are standing straight up for more even cooking and they will keep their shape better if they cook standing up. Lay out the meats, flour and softened husks on a table so that everyone helping can reach the meat and the masa. Some husk pieces can be pretty big, you can cut or tear these in half. Using the back side of a table spoon, scoop a generous amount onto the husk and spread an even and thin layer of masa on the husk. Start from the left side of the husk and stopping at least an inch from the end of the right side. Spread up the husk leaving enough on the end to fold over on top of your roll. There is no true wrong way to do this! What matters is the thickness of the masa that is being spread. In restaurants, you’ll often get tamales that look like pillows of masa with a tiny bit of meat in them! We kept our masa layer thick enough to hold the roll, yet thin enough to not overpower the tamale. 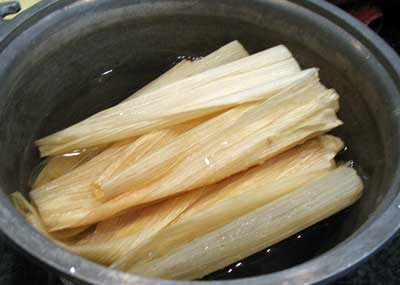 Once the strainer pot is filled with upright tamales, put it into the pot of boiling water to steam. And cover the pot. 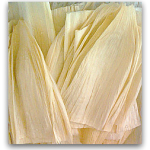 You want to make sure that the tamales are packed so that they are all standing BUT do not pack them too tightly. 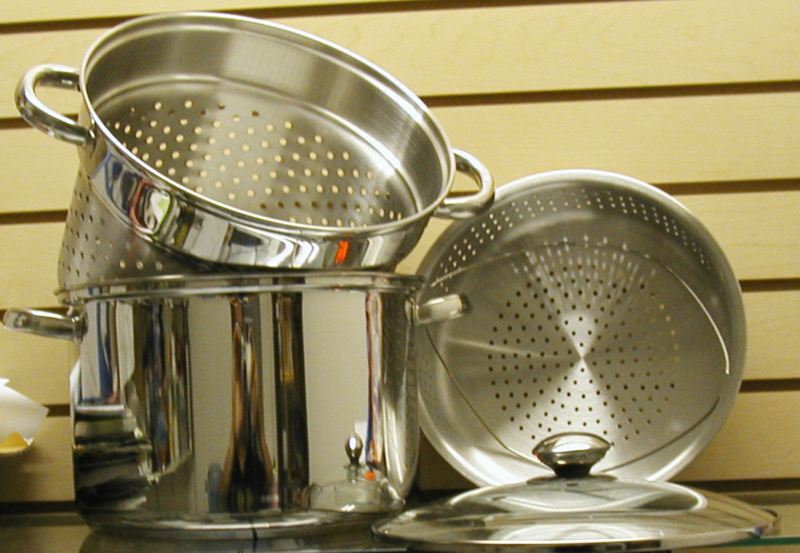 Make sure you continue to check the pot and add more water to the pot as needed. So cooking time is the other hiccup I had . . . other recipes said the tamales should cook for at least 2 hours. At two hours, we checked the consistency and it was just not there yet. At three hours, we pulled one out and let it rest for a few minutes before attempting to unroll. This worked. 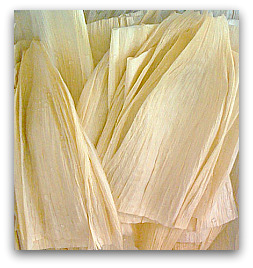 You need to allow the tamales to rest for 5-10 minutes after removing them from the heat to firm up. Let’s just say there was a lot of room for improvement but none of it mattered because the TAMALES.WERE.DELICIOUS. 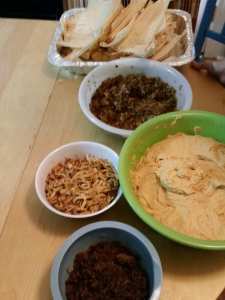 I served them with my carne sauce (meat chili) and green tomatillo chile sauce. Sounds just like my experience with cooking time. Always end up cooking longer than recipe says but I also found you have to let them sit a bit before testing for readiness. So fun! Eating some of my homemade bean and cheese tamales right now 🙂 Love you and miss you!!!! You are so right!!! 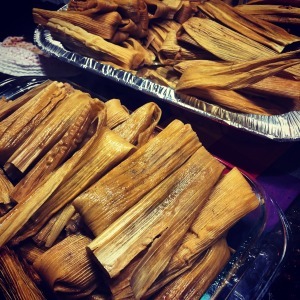 I think the total cooking time for all 139 tamales was somewhere close to 5 hours!!! 🙂 and letting them sit a bit was the key! Miss you too!